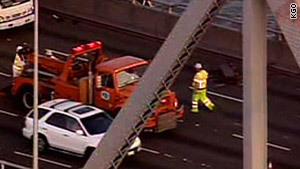 Workers respond to Tuesday's accident caused by debris which fell from the San Francisco Bay Bridge. (CNN) -- A piece of steel and cable fell from the San Francisco Bay Bridge onto the roadway Tuesday, causing an apparently minor two-car accident but backing up traffic for miles, the California Highway Patrol said. The Bay Bridge is one of the main arteries into and out of San Francisco. No one was injured in the accident, which happened at 5:32 p.m. PT (8:32 p.m. ET), but the driver of one car "appeared to be shaken up," CHP Officer Peter Van Eckhardt said. "It appears to be an area where temporary repair was done over Labor Day weekend," Van Eckhardt said. "It was unexpected to say the very least." The incident closed down three lanes on the five-lane bridge, backing up traffic into the Oakland area. Aerials from CNN affiliate KGO showed a black sedan with its hood flipped up onto the windshield and a rental truck stalled on one of the lanes. The scene of Tuesday's accident is near the area of another traffic-stopping accident on October 15, when a truck flipped over and blocked several lanes of the bridge.